Hike up into any of the conifer covered slopes outside of Jackson and there’s a good chance you’ll hear the distinctive caw-caw call of the Clark’s nutcracker. Now, in May, the nutcrackers are likely breeding, and you may hear several of the other, rarer, lovely nutcracker calls and songs. If you’re lucky, you’ll see one of the birds carrying nesting material, or another tucked away on its twiggy nest. Keep looking for these birds as summer progresses, and you’ll soon see the clumsy, loud, curious fledglings doing acrobatics while begging their parents for food. When autumn arrives, climb up into the whitebark pine stands, and at times you’ll see dozens of Clark’s nutcrackers tearing into the pine cones, devouring the high-energy seeds, or systematically filling up their sublingual pouches so they can transport and cache them for winter meals. Next winter, if you put out suet feeders, there’s a good chance nutcrackers will head down into the valley to feast on your offering. These seemingly common birds have a fascinating relationship with whitebark pine: the trees provide rich, fatty seeds (with more calories per pound than chocolate! ), and the birds “plant” the trees’ seeds —a single bird may hide up to 98,000 seeds in a year. The food caches help the birds get through the winter, and the leftovers grow into new trees. In fact, whitebark pine trees are obligate mutualists of Clark’s nutcrackers because their seeds sprout almost exclusively from nutcracker seed caches. Clark’s nutcrackers do also forage on seeds of other conifers, particularly limber pines and Douglas-fir in the Great Yellowstone Ecosystem, and these birds play an important role in forest regeneration and seed dispersal for at least ten conifer species throughout their range. Nutcrackers disperse seeds up to 32.6 km, moving seeds longer distances than wind, rodents and every other North American seed-hoarding bird. Whitebark pine is a keystone species because many species depend on its high energy nuts, and it is valuable for watershed protection. It is found in mixed and dominant stands in over two million acres within the five national forests and two national parks that make up the Greater Yellowstone Ecosystem. Whitebark pine is declining due to multiple ecological disturbances including widespread infection by the nonnative white pine blister rust, mountain pine beetle attacks, wildfires and climate change. As of 2009, 46% of the whitebark pine stands in the Greater Yellowstone, one of the healthiest remaining whitebark pine ecosystems, were classified as “high mortality”. Based on the Greater Yellowstone Whitebark Pine Monitoring Working Group’s results through 2015, the remaining live whitebark pine stands in the region had blister rust infection rates ranging from 14% to 26%. The ongoing threats and high mortality has led to whitebark pine being listed as a candidate species under the U.S. Endangered Species Act, and its listing as an endangered species in Canada. While whitebark pine restoration efforts are underway, these efforts will not be effective if Clark’s nutcracker populations decline and they are not available to disperse seeds. We have limited information on nutcracker population status and behavior. But, although nutcrackers do eat seeds from multiple species, evidence suggests that declining whitebark pine communities are leading to reduced local Clark’s nutcracker populations. In the Greater Yellowstone, Clark’s nutcrackers have exhibited population-wide failure to breed, with nonbreeding years following low whitebark pine cone crops the previous autumn. Recent surveys in the Greater Yellowstone suggest a high probability of Clark’s nutcracker occurrence in the region. However, a recent analysis of the North Coast and Cascades Network’s landbird survey data from 2005-2014 found Clark’s nutcracker to be declining in the Pacific Northwest parks. Because these birds regularly move long distances as they follow the cone crops, the status of nutcracker populations elsewhere may impact stability of the local nutcracker population. In fact, the nutcrackers we see in other regions might be our birds. In my recent work, I satellite-tagged seven Clark’s nutcrackers near Jackson, then followed them online for three years. While in the region, before they started harvesting seeds in autumn, they moved over a massive area, ~17,500 ha. Then, four flew up to 650 km into Utah to overwinter one year, and another flew up into Montana – four of the five then returned to Jackson. Not only are the Clark’s nutcrackers and whitebark pine in a fascinating mutualism, but their relationship, and the cascading effects the life or loss of these species have on dozens of other species remind us how interconnected species, communities and ecosystems are. The regular long-distance movements of these birds emphasize how intertwined the health of Jackson’s mountains are with distant ecosystems in Wyoming and other states. We are reminded that the world is one enormous, interconnected entity, and we need to pay attention to what’s happening in our own backyards as well as what’s going on in the world far beyond the valley. 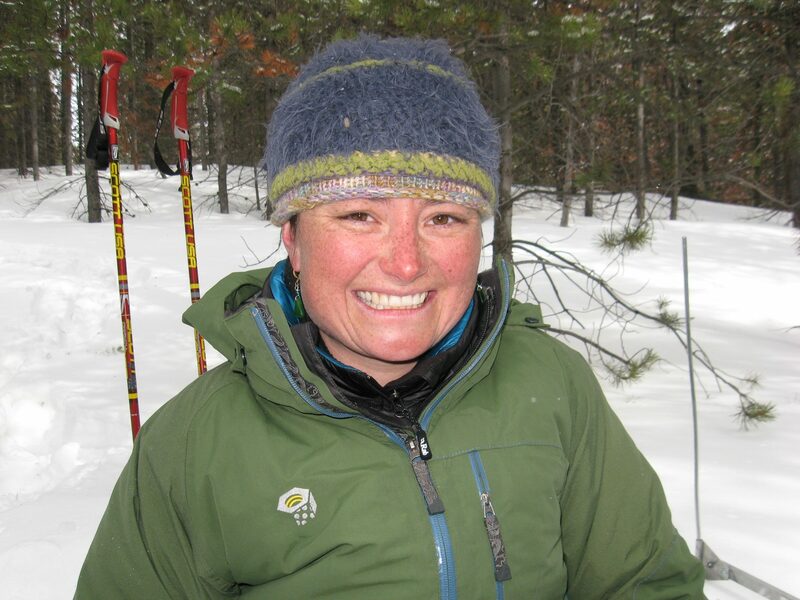 Since 2009, Wildife Ecologist and author Taza Schaming has been investigating the response of the keystone mutualism between whitebark pine and Clark's nutcrackers to declining habitat, first in the Greater Yellowstone Ecosystem, then expanding into the Cascade Range in Washington. She finished her PhD at Cornell University in 2016, and is continuing her research as a long-term study. Through her work, she is striving to better understand and promote resilience and stability of plant-animal seed disperser mutualisms in the face of widespread environmental change. Now also a mother, Taza is now delighted to be raising her three-year old daughter with a pair of binoculars in her hands.